Sharp, clean and simple, The North Face Boys' Glacier 1/4 Zip has the versatility he needs to meet a year of changing weather conditions. 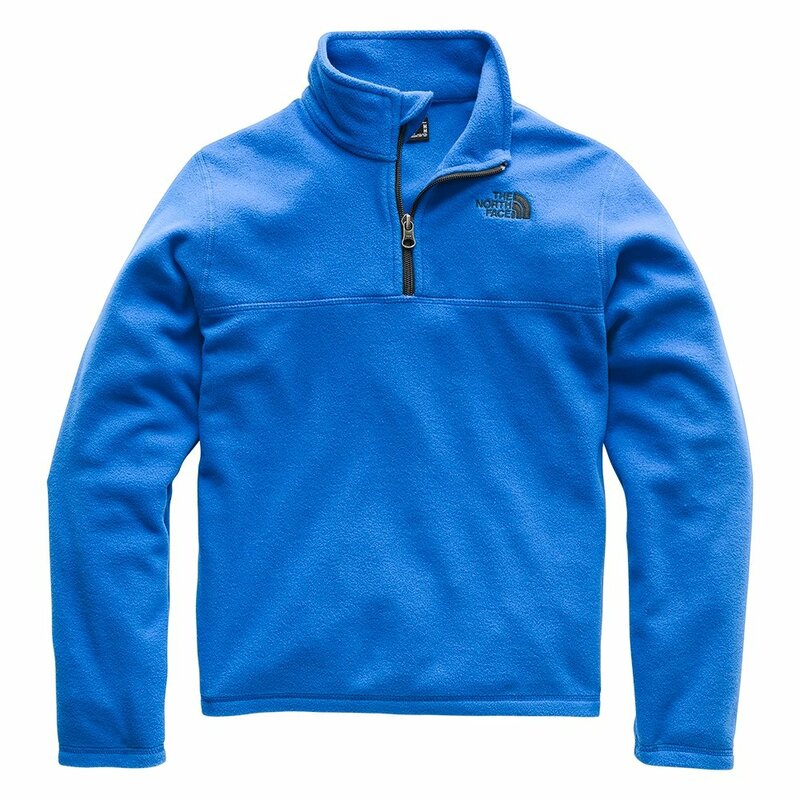 This soft, warm poly micro fleece quarter zip can provide insulation on its own or in conjunction with additional layers. The durable fabric holds up to abuse and features a pill-resistant surface for prolonged softness. The contrast upper and embroidered logo create a crisp look. Center back length measures 21½"
Very cute coat for a little boy toddler to teen. Perfect for fall or layering but if you want something warm then note it is very thin fabric. My son loves it on 50 degree days though because he is always hot from running around. The zipper is not yellow and red color. It was navy. The zipper is not yellow and red color. It was navy color zipper. It made the jacket look average and not as fun as i expected. I was disappointed and returned it. Im sure the jacket is very wam and light. Serves the purpose well. My daughter wears a 6x and I bought the size small jacket. Even though it is a bit big, it still looks great on her and she'll get a few seasons out of it! Great light weight, but heavy enough to keep her warm on cooler days. Great material, and pretty color! Love Northface and the clothes for my kid too. This is definitely warm and will keep him warm this winter! Perfect weight for spring/fall or cooler temps. Holds up great with many washes. This sweater is amazing my niece loved it, it's super warm. The size chart helped alot she wears a 6t and per the chart that's an extra small and sure enough it fit great. Bought this for my daughter for Christmas and she absolutely loved it!! Great price and awesome fit.. This material is so soft, my son loves it! Will be ordering more. I bought this hoodie for my Goddaughter's birthday! She loves it! And so do I! It's percect for Fall and Spring season! She's 4 years old and size of this fits her great. Although the length is a bit long for her but the body size is just right. I would recommend this hoodie!! This is a perfect jacket for kids who don't like bulky coats but need to keep warm! Love it. Perfect fit. Nice material. It's a really good item. My son loved it and it's nice and cozy !! nice hoodie - good price on sale. my daughter loves it. my daughter is 11 and wears 10-12, but M was too snug for her. L fit nicely.